I have always found it fairly easy to connect with people, and I over-think a lot of things so let me share with you a theory of mine about people. It’s nothing particularly ground-breaking, and it certainly hasn’t been put to the test. I would like to create some experiments and validate it when I have some time though. Well anyway, even though I seem to be able to connect with people easily I meet many people who tell me they can’t. Obviously some of this is the halo effect, but I think there is also another part and that is the way in which people see relationships with other people. I could map out a number of ways that, to me, seem impractical, so it may be more useful to provide how I see relationships. I believe there is a structure; stages that you have to move through before you can develop deeper relationships. I’ve included a diagram here to help explain. You’ll see the bottom section of the pyramid is labeled Primal. This is what I would describe as how we understand people’s base needs. We can relate to the fact that people want to be safe, have food, and be happy. Though we may disagree as to how to achieve this we understand that these are things that people want. It takes no real effort to have a primal bond with someone and so it creates no real connection. The next section is labeled societal. This is another shallow and effortless understanding we have. We understand that there is a system in place and we generally want to adhere to that system. For instance, you may see a parked car taking up two spots at the same time as someone else. You both may feel a bond that is brief and fleeting as you both recognize that this third person is disrupting the system. You likely won’t ask the person’s name or write to them once a week, but it might start up a brief conversation. 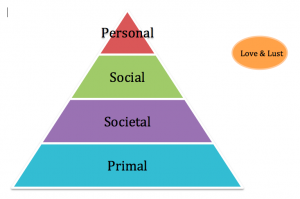 The next section is labeled social. This is the first section of the pyramid where you have to make a choice and some effort to maintain these connections. This is akin to seeing someone with your favorite band on their t-shirt. You have expended some minimal effort to make this connection and explain to them why you feel a bond. They likely will in-turn feel a bond with you. The more effort you put in here, the more you can grow that bond. If it grows enough, you may end up in the last section. Personal connections are those where you have a good understanding of an individual. You have made it though the social bonding and you now care not only about what this person thinks about a TV show or if they play the same sports as you, you care about them. Their happiness, health, and personal development replace the hobbies, political beliefs, and other social bonds you started with. This takes time, trust, and effort to build up to. Now, you’ll see I have Love and Lust off to the side. You might think that’s odd since the common belief is that we move from friends to romantic partners, and we do, but I don’t think that is a truly different type of connection we make with someone. In my opinion, love and lust interact with the personal connections you have, but are not the “next level” of connecting with someone. Think of personal connections as a cement sidewalk. As time goes on events happen that can crack or damage the sidewalk. Love and lust can act as a filler to maintain this deep connection and mend the damage. Love being the sometimes less aesthetic and longer-lasting fix, while lust is the quick but weaker patch. Either can be applied, but patching up the sidewalk once won’t make it good forever, just like loving someone for a year won’t keep you together for a lifetime. This of course is still all separate from personal connections. I can have deep personal connections with people I don’t love or lust for. Of course I love my friends, but I also have somewhat one-way personal connections with people whom I might consider enemies (though that word seems a bit strong.) This plays into the underutilized skill of empathy. You can understand where someone is coming from, want them to do well, but not particularly like them in any way. These tend to be the relationships you stop maintaining. Over time people change so it’s unlikely any personal connections will last long without love or lust, but they do exist for a time. I’m positive that I’m beginning to ramble. Anyway, my main point here is that this explanation could be extrapolated to explain people like myself. I love strangers I know very little about, I want people I don’t love to succeed, and I value each of the opportunities I have to connect with other people.